Does anyone have information on what anti-virus programs are compatible with Windows 8?? Hey Nightowl - G'gay mate!! To the best of my knowledge there should be very few compatibility issues with software, whatever works in Windows 7 should also work fine in Windows 8 - including AVs. For anyone who wants to be absolutely certain (for that "just in case" scenario), I would install Microsoft Security Essentials. Thanks for the come back, I thought that might be the case, but wanted to check before. So I can assume ( and you know what that means) that any of the free AVs like Avast should work. I'll give it a try and see what happens. Windows 8 has anti-virus built in. 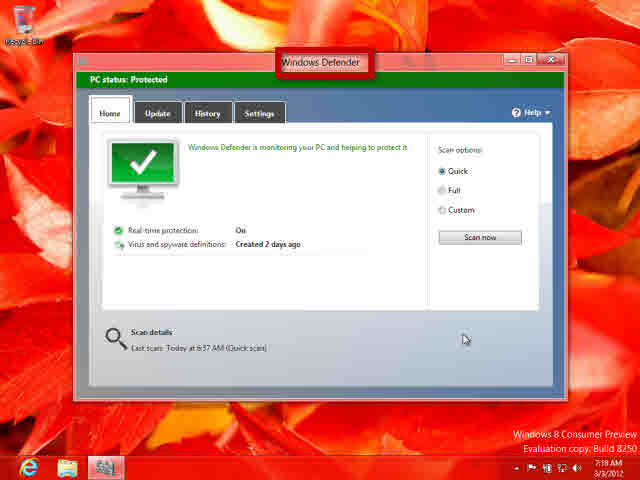 Microsoft developed the Defender antimalware program and included it in Vista and Win 7(downloadable for XP users). They also developed Microsoft Security Essentials and made it available for download to XP, Vista, and Win7 users. For Windows 8 Microsoft has merged the features/capabilities of Windows Defender and Microsoft Security Essentials into one AV/AM program and renamed it to Windows Defender. It is included in Windows 8 by default. If you're curious you can read a bit more about it on Steven Sinofsky's Protecting you from malware blog post. MSE has had a good reputation in its' previous state. I think this may be a boon for malware writers as they have one HUGE target to focus their attention on. We don't know exactly how this will perform in the real world yet. Here's a screenshot. Notice the familiar MSE interface with the new "Windows Defender" in the title bar. So Dave, if someone wanted to install a different AV, say Avast Free, is there a simple method in Win8 to permanently disable the built-in protection? You'd have to disable the Windows Defender Service and Windows Defender Network Inspection Service. Move the mouse to the upper right corner and then click on the search charm. Search for Services and click on the result. The Services applet is just like previous Windows versions. Hmm, so MS haven't made it too easy then. I should have mentioned that it would be best to open Defender and disable real time file monitoring and turn defender off in the options before disabling the services. Well I'm not sure if there are any specific tests that have been done about the ability of Defender to protect itself from threats disabling it, but definitely don't want it to be too easy. Good point. But most of the people I deal with are not going to know anything about services - how to get there, how to change the status. And I would suggest that will be true of a very large number of 'average' users. So it seems Defender may well become the new Internet Explorer - i.e. it's already there and not easy to get rid of. Also, many AVs include a right click option to disable protection, I know Avast does for example. Not sure that necessarily relates to poor self-protection. I don't want to muddy the waters, however, I have installed Avast free then went to Control Panel/Windows Defender and it has been turned off and is not monitoring. Not sure if the Services route is necessary. By poor self protection I mean the ability for a rogue program or malware to disable the active AV so that the user isn't made aware of the infection and/or other malware programs can be installed. Nightowl, would you mind checking? It would be interesting to know whether the installation of a third party AV automatically disables Defender. "By poor self protection I mean the ability for a rogue program or malware to disable the active AV so that the user isn't made aware of the infection and/or other malware programs can be installed." I'm well aware of what self protection is mate and also what you meant by it! In answer to your question, yes, as far as I can tell Avast did shut down Windows Defender. Just to see I uninstalled Avast and Windows Defender popped up and updated. So I'm sure that when Avast is installed it will turn off Windows Defender.